Perched high on a cliff with fantastic ocean and mountain views, Shearwater Resort offers luxury two bedroom suites with 1,260 sq. ft. of living space. The resort’s exceptional amenities and convenient location are perfect for a fantastic vacation. Buy a timeshare at Shearwater and see for yourself! Shearwater’s spacious suites for sale are richly appointed with colorful Hawaiian furnishings. The master bedroom has a king bed and bathroom with a relaxing whirlpool tub. A second bedroom has a queen or two double or twin beds and full bath. With an additional sleeper sofa in the living room, up to 6 people can stay in comfort. A full kitchen with dining area provides all the amenities needed for in-unit dining. Enjoy morning coffee surrounded by the splendor of Kauai on a private, furnished balcony or patio. A washer/dryer, 3 TVs with cable/satellite, and video and CD player are included. You may want to just stay onsite with the engaging activities offered when you buy a timeshare at Shearwater. Owners rave about the pristine ocean-view pool, soothing Jacuzzi, lovely, easy to walk surroundings and the fun activities for all ages. Have you tried any hula lessons or lei making lately? 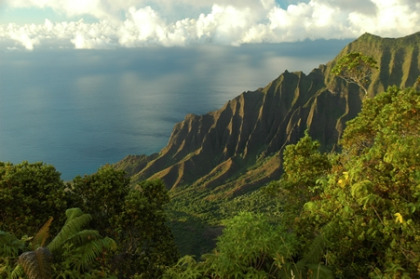 The tour desk will get you on your way to all the many incredible activities of the Garden Isle of Kauai.